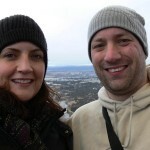 ACT blogger Mick shares why you shouldn’t disregard Canberra as a romantic getaway destination. You could be excused for thinking that there are better places to go for a romantic weekend than Canberra, but the nation’s Capital is well and truly under-estimated as a romantic location as my partner and I were soon to discover. We took an early mark from work on a Friday afternoon and checked into one of Canberra’s most renowned and long standing hotels, the Hyatt Hotel Canberra. This hotel, originally named ‘Hotel Canberra’, was purpose built in 1924 to house politicians whilst parliament was sitting. As we entered the hotel, we were immediately struck by the grandiose architecture of this amazing and beautifully restored hotel. The entire building and its grounds are immaculately presented and maintained including the park room that we checked into, which was well and truly sufficient for the comfort of a couple. With an hour to spare before our dinner booking, we decided to have a couple of sneaky drinks in the ‘Speaker’s Corner Bar’. The small but warm bar was full of life for a Friday afternoon and we lustily enjoyed our drinks and complimentary spicy nuts. The ‘Promenade Café’ boasts an extremely generous buffet with salads, cold meats, hot dishes and seafood options aplenty. Trays full of prawns, oysters and octopus salad looked succulent as did the array of meats and cheeses. You are sure to have your fill and more at this restaurant. The hardest part was deciding how much to fit onto the plate for each buffet visit! The service was excellent and judging by the large groups of people present on this night, it’s a popular destination, as we discovered, for celebrating a birthday, engagement or graduation. We turned in early, comfortably resting in a deliciously soft king size bed, setting the alarm for a dawn-cracking 6am. No sleeping in tomorrow as we prepare for an early morning flight over Canberra! As a 23 year Canberra resident, I have long witnessed the myriad of hot-air balloons that float over my fair city, none moreso than during the annual balloon festival in Autumn when dozens of balloons launch from the lawns of Parliament House in a kaleidoscope of colour. 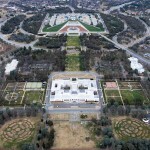 Today we were to experience the bird’s eye view of Canberra thanks to Balloon Aloft. 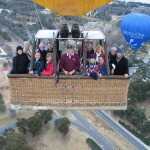 Renowned for 30 years of ballooning in Australia, they are very recognisable and known for their service and safety. The chilly Canberra morning did nothing to deter us and 10 other people from bundling into a van and heading to the launch site. 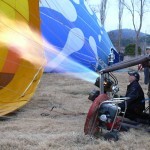 The process of unfolding and inflating a massive hot air balloon was eye-opening, especially when being asked to assist. Luckily I was given some gloves to protect my hands from the huge fans that were used! The heat from the gas flame that warms up the air inside the balloon was welcome as 13 of us clambered inside the surprisingly large basket. Before you know it, the balloon begins to rise and the moment that you see the ground rapidly receding below you is one of exhilaration and excitement. There can be no smoother form of take-off than a hot-air balloon! The following hour was one of amazement and enthrallment as we got to see Lake Burley Griffin plus all of the major landmarks of Canberra from the best vantage point imaginable. The flight itself was so quiet and calm with the only real sound being the excitement of the fellow passengers and the occasional blast of the flame into the balloon. There can be no better way to view a city than from a balloon. It gives you a great perspective on a city’s size and topography. Canberra has beautiful surrounds with mountains and plains in all directions. This makes for a spectacular view whichever way you look. Before the flight, we were taught how to hold on should we have a rough landing, but our expectations were cast aside as the pilot simply dropped us down into a vacant paddock with hardly a bump. The flight finished with champagne and orange juice back at the Hyatt and chance to check out the multitude of photos that had been taken. To round off a magical morning, we dug into the breakfast buffet back at the Promenade Café. If it were possible to outshine the dinner from the previous night, this breakfast did so. Tray upon tray of delectable food to choose from, not to mention an omelette chef, who would present your desired eggs, cooked perfectly, directly to your plate. With a late check-out, we returned to our room to relax and reflect on an amazing night and morning and just a taste of what Canberra has to offer. Sold! I’d love to do this!